pharmacological and non-pharmacological approaches to helping patients to stop smoking. Smoking is the leading cause of preventable death in Great Britain1 and is one of the most significant factors impacting on health inequalities and ill health; especially cancer, coronary heart disease, and respiratory disease.2 Approximately one-half of persistent smokers will die as a result of their habit and on average, cigarette smokers die about 10 years younger than non-smokers.3 Helping smokers to quit brings huge benefits to a range of people and services, particularly general practice. Practitioners should be aware of the positive outcomes that can be achieved in general practice from targeted smoking cessation and the impact this can have on their practice, which includes a reduction in the number of smokers, appointments, home visits, and unplanned emergency admissions. 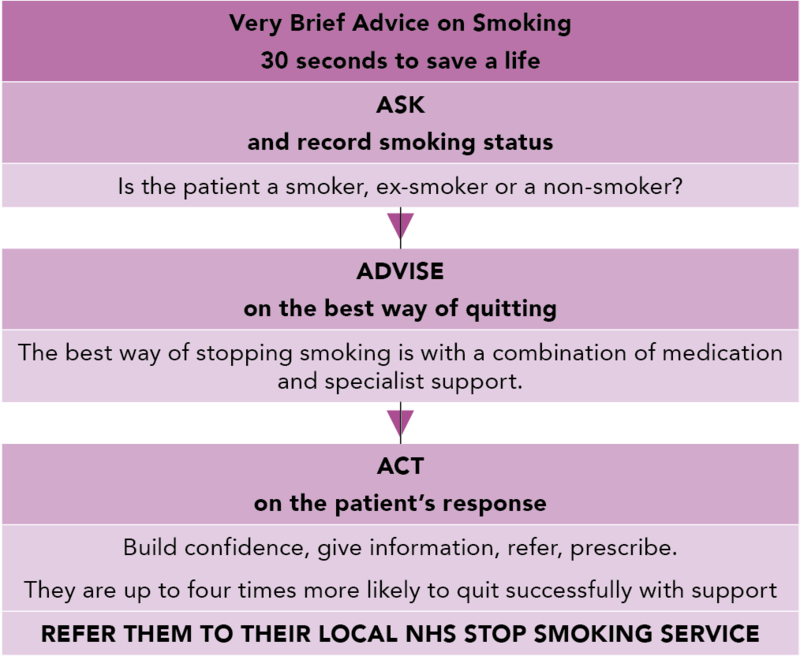 All healthcare professionals should provide VBA on stopping smoking (Ask, Advise, Act; see Figure 2, below) and routinely refer smokers to local stop smoking service providers. Training on the delivery of VBA is available as a short e-learning module and may be available from your local stop smoking service. Simple changes to how you talk to patients who smoke can really make a difference in supporting them to move towards a quit attempt. Instead of asking if they want to stop smoking now, ask, 'Do you see yourself as a life-long smoker?' Most smokers don't see themselves smoking for the rest of their life. A useful follow-up question would be, 'Is there any particular reason you are waiting before you quit? '—for some patients this means they will bring their quit date forward as they wonder what they have been waiting for. Where possible, link smoking to the condition that the patient is presenting with as this will provide a 'teachable moment'. Patients are likely to be more susceptible to advice in these situations, with their health at the forefront of their mind.13Visit Ash.org for more information on the links between smoking and a range of disease areas. Healthcare professionals have a duty of care to offer the most effective stop smoking support available, and to offer potentially life-saving treatment without delay. In the case of smoking cessation, this support is likely to come in the form of an NHS stop smoking service, which your practice may provide inhouse with staff trained as Stop Smoking Advisors, your local service may deliver at your practice for you, or you may refer patients out to another venue. Whichever method of service delivery you have at your disposal, it is vital that the referral process is quick and easy. the patient's previous experience of smoking cessation aids. In practice, smokers who have tried other methods of quitting could be encouraged to try e-cigarettes and those smokers not ready to quit could be encouraged to switch to e-cigarettes as a harm reduction strategy. Tobacco smoking is a chronic relapsing condition;20 therefore, most smokers will make several attempts to quit before they do so for good. Any period of quitting should be seen as a success, as it is a step towards quitting for good, and relapses should be seen as temporary disease flareups requiring further treatment.8 So, it is important to keep raising the issue and keep supporting the patient to quit in order to give them a much greater chance of quitting. Community pharmacies see over 1.6 million people per day, and are often people's first point of contact with health services.21 They are a valuable setting for referring and/or supporting smokers to quit. In addition to offering health promotional material, pharmacists should ask customers, 'Does anyone in your household smoke?' to identify smokers. Over 60% of the adult population in England visits a dentist for regular check-ups.22 Many people are not aware of the effects of smoking on the mouth so it is important to highlight these to smokers. As well as its general health benefits, stopping smoking has also been associated with improved dental outcomes.23 Ask about smoking as part of the patient's medical history, and ask again regularly, outlining the links between smoking and oral health. For more information, the NCSCT has developed a fact sheet. Public awareness of the effects of smoking on the eyes is low, yet the prospect of going blind (for example, from age-related macular degeneration) can be a strong motivator to quit.24 Ask about smoking as part of the medical history, and ask again regularly, outlining the links between smoking and eye health. Doll R, Peto R, Boreham J, Sutherland I. Mortality in relation to smoking: 50 years' observations on male British doctors. BMJ, 2004; 328: 1519–1527. Callum C, Boyle S, Sandford A. Estimating the cost of smoking to the NHS in England and the impact of declining prevalence. Health Econ Policy Law 2011; 6: 489–508. West R, Brown J. 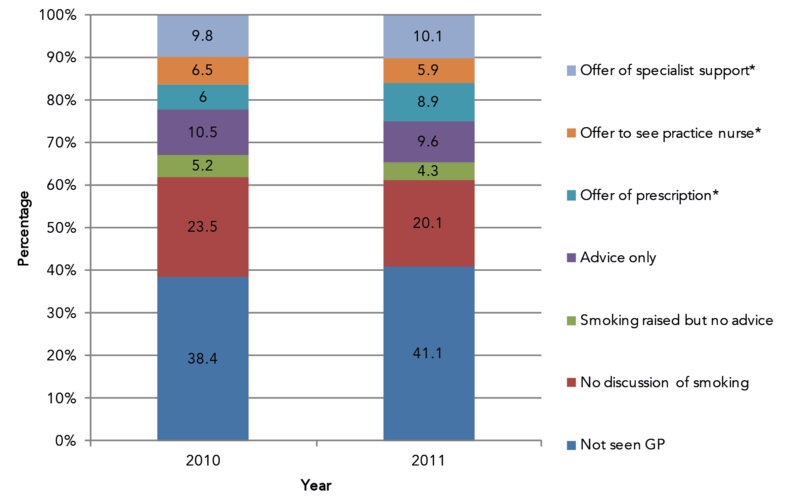 Smoking and smoking cessation in England 2011: Findings from the smoking toolkit study. London, 2012. Available at: www.smokinginengland.info/sts-documents/ (accessed 7 December 2016). Rennard S, Daughton D. Smoking cessation. Clin Chest Med 2014; 35: 165–76. NHS Health Check website. www.nhs.uk/Conditions/nhs-health-check/Pages/NHS-Health-Check.aspx (accessed 6 December 2016). NHS Employers. 2016/17 General Medical Services (GMS) contract Quality and Outcomes Framework (QOF)—guidance for GMS contract 2016/17. NHS Employers, 2016. Available at: www.nhsemployers.org/your-workforce/primary-care-contacts/general-medical-services/quality-and-outcomes-framework (accessed 7 December 2016). Aveyard P, Begh R, Parsons A, West R. Brief opportunistic smoking cessation interventions: a systematic review and meta-analysis to compare advice to quit and offer of assistance. Addiction 2012; 107 (6): 1066–1073. Flocke S, Antognoli E, Step M et al. A teachable moment communication process for smoking cessation talk: description of a group randomised clinician-focused intervention. BMC Health Services Research 2012; 12: 109–121. West R, Beard E, Brown, J. Smoking toolkit study—Trends in electronic cigarette use in England. University College London, 2016. Available at: www.smokinginengland.info/sts-documents/ (accessed 7 December 2016).